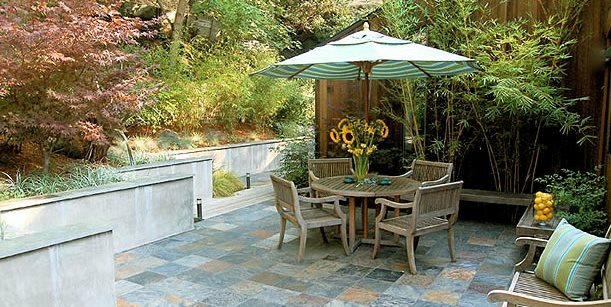 A sloping site set the parameters for this small patio that accommodates a coffee table and lounge chairs with plenty of room behind them to walk. 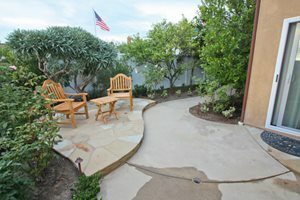 The beauty of such small spaces it the limited amount of paving, which easily allows upgrades to stone within the budget. The step back position of this series of retaining walls helps carve space out of this preexisting wooded slope. The installation of wood benches along the back wall of the house and the lovely weathered teak furniture allow plenty of stylized items in minimal space. This small raised flagstone patio was likely added on to the existing concrete paving around the rear of the home. Creating a step up and just enough room for a couple to sip cocktails makes this a special spot outdoors at the end of the day. 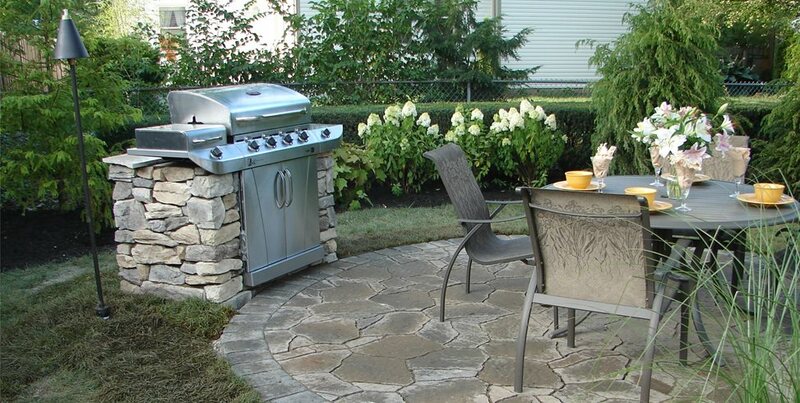 Concrete pavers are the most popular patio paving materials because they are affordable, sustainable and easy to install on a sand and gravel bed. The difference in paving patterns from the ground plain to the step up round space creates more visual interest where space is limited. 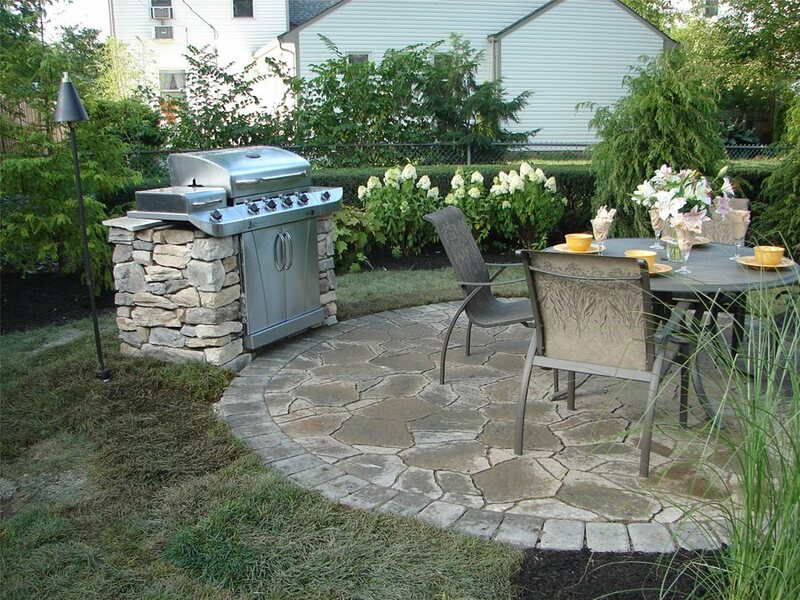 This small circular patio features a high end built in barbecue, flagstone and paver edge band to emphasize the perfectly round shape that's ideal for a five foot round table and chairs for convenient dining. 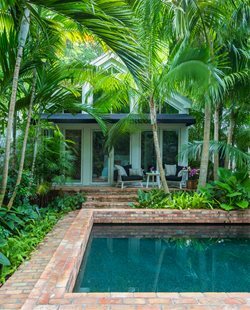 The national trend toward smaller homes and lots has challenged designers to create usable outdoor living spaces in very tight spaces. 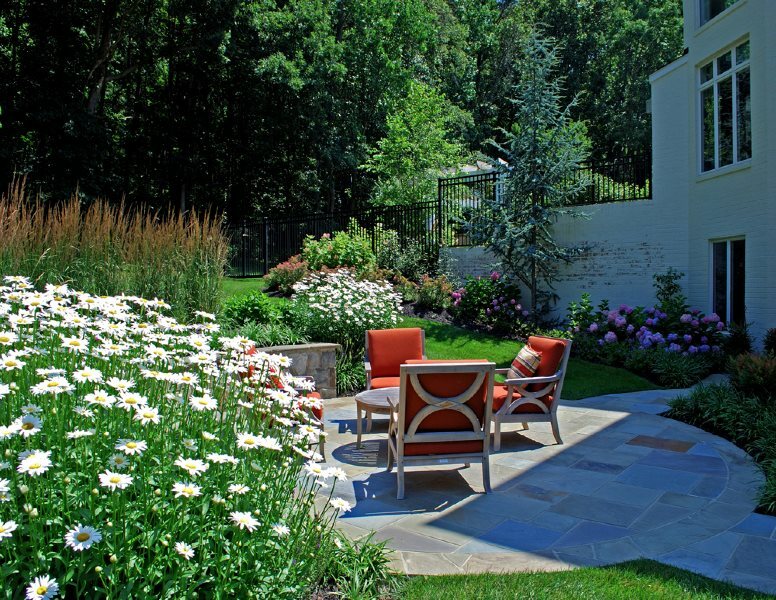 Here patio planning is doubly important in terms of detail because this space may be vital to expanding very small rooms into the outdoors both physically and visually. Physical space is vital to increasing overall living space by opening doors to the yard where a living room flows out into the patio. Together both spaces become greater than the sum of its parts. Visual space is closely linked to the overall aesthetic, so that the patio reflects materials and colors used for the interior. That way the view from indoors flows seamlessly into the outdoors through windows, sliders or French doors. While the living room is no larger physically, it feels bigger due to the additional window views. With small spaces, the trend is toward getting as much use out of each feature in as many seasons as possible. Adam Heath of Virginia's Mid Atlantic Enterprise enjoys grilling himself and strives for small patios about 600 square feet. "That lets you have seating for 4 to 6 with a grilling area." 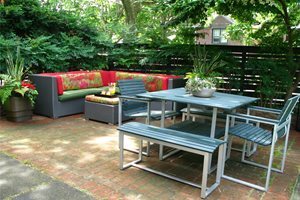 Seatwalls are a valuable amenity for overflow guests or for convenience in the off season when outdoor furniture is stored for the winter. 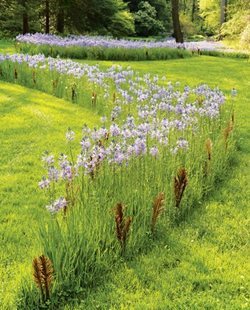 Chris Major, landscape designer at Blue Ridge Landscaping in Holland, Michigan stresses the importance of custom design features to create a multifunctional space. "Double duty design elements allow the greatest use of the space. An outdoor couch can have bins built underneath. Modular units and nesting elements are important for features that may be downsized when not in use. 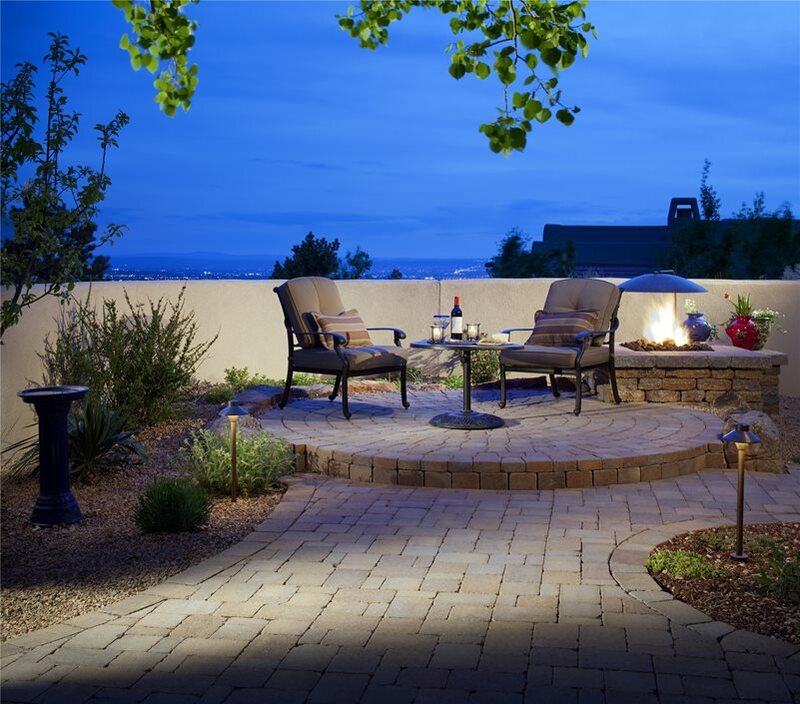 Smaller patios must have adequate circulation space around the features or it's just too crowded." At New York's Neave Group, owner Corey Bittner warns against overcrowding. "You don't want to feel locked into a patio. Seatwalls are suitable, but you don't want anything that causes a feeling of constriction." 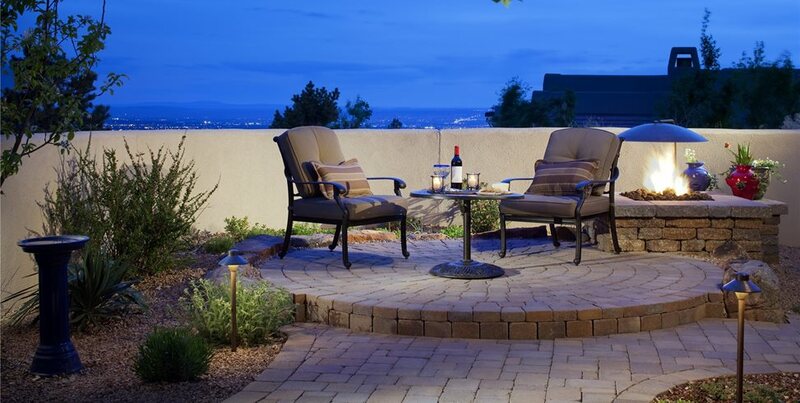 The most recent trend is toward the universal use of precast concrete pavers. 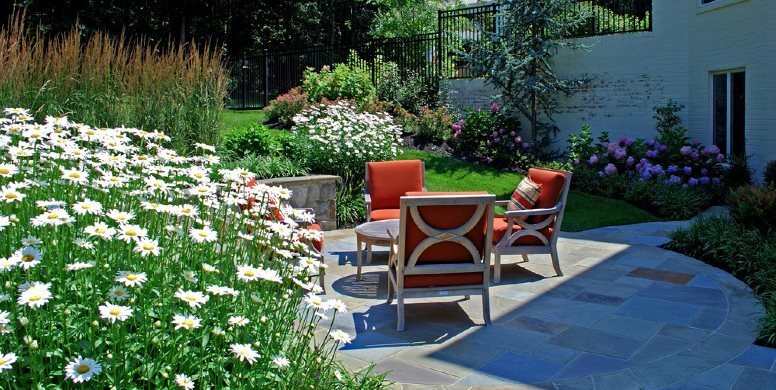 Major, like many others are using pavers on high end projects as well as more modest budgets. 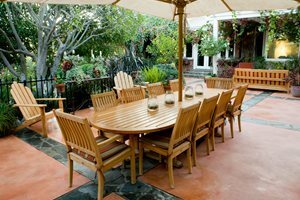 His patios average $15 to $20 per square foot, "but that can change with elaborate designs that demand more cuts, angles, pattern adaptation. 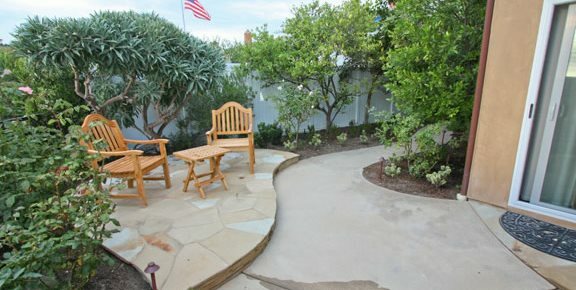 I try to be tasteful so the pavers will make a beautiful patio now and in the future." 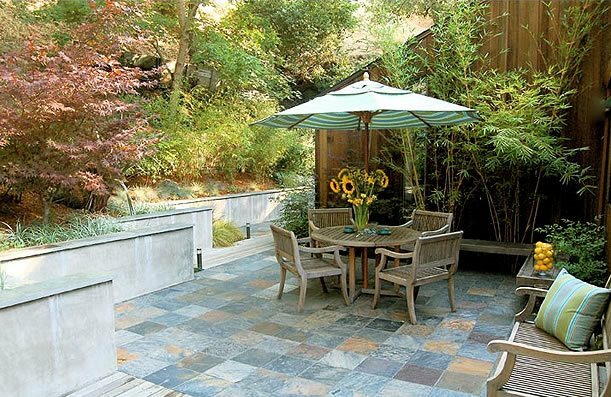 "We like a simple tumbled paver for a timeless look. I try to work with architecture of the home such as a recent prairie style home project where we selected a paver with a slight Asian character. 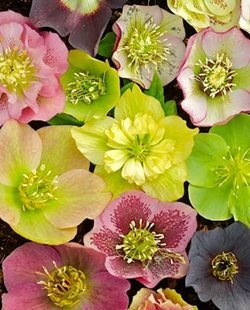 It featured a dark rugged edge that's softer and more high contrast with our peripheral plantings that enhance this soft appeal. The bluish tone of that pattern we worked into the pavers was more relaxing and stress relieving due to its muted tones that helped mitigate all the brick on the house facade. I didn't want to match the house color with pavers- we did that once and were not happy with the paver tones were not an exact match due to manufacturer's variability."